Today we’re doing something a little different. 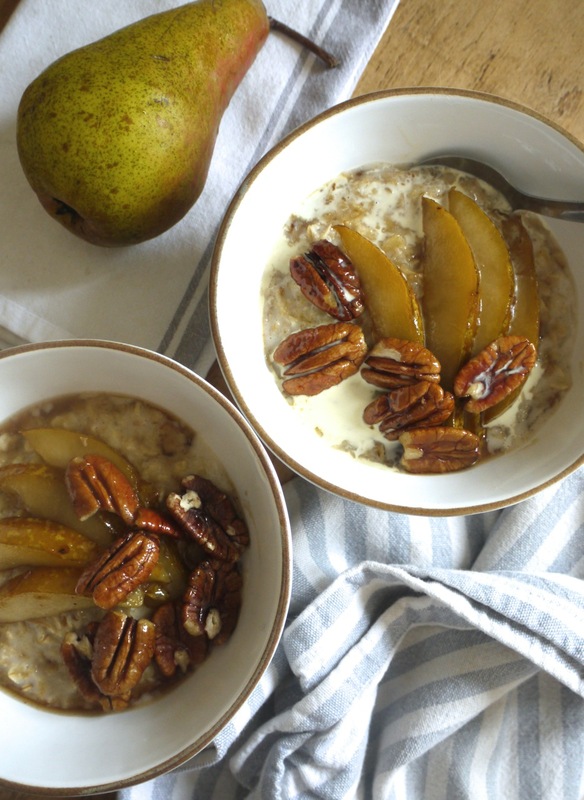 I’ve got a recipe for you – this creamy, comforting bowl of porridge jazzed up with mapled pears, spice and pecans to warm your autumn mornings – but there’s a little something extra on offer, too. I don’t own much in the way of ceramics. so the eagle-eyed amongst you might have noticed that these rather charming breakfast bowls are new. New to me and potentially to you to as I’m offering one reader the chance to win a set, plus a copy of my book. It’s not often you see a sponsored or branded post in this space, but these gorgeous bowls come from a company called Loaf and with a name like that I simply couldn’t resist. I first discovered Loaf.com when we were hunting for a new bed. I’m a sucker for beautiful catalogues and their rustic, whitewashed countryside aesthetic is something I aspire to from the sofa of our little London flat. Beyond furniture, they also do a lovely line of mugs, bowls, plates and other kitchen accessories and were kind enough to gift this little loaf a set of Wobbler ceramic bowls and plates. 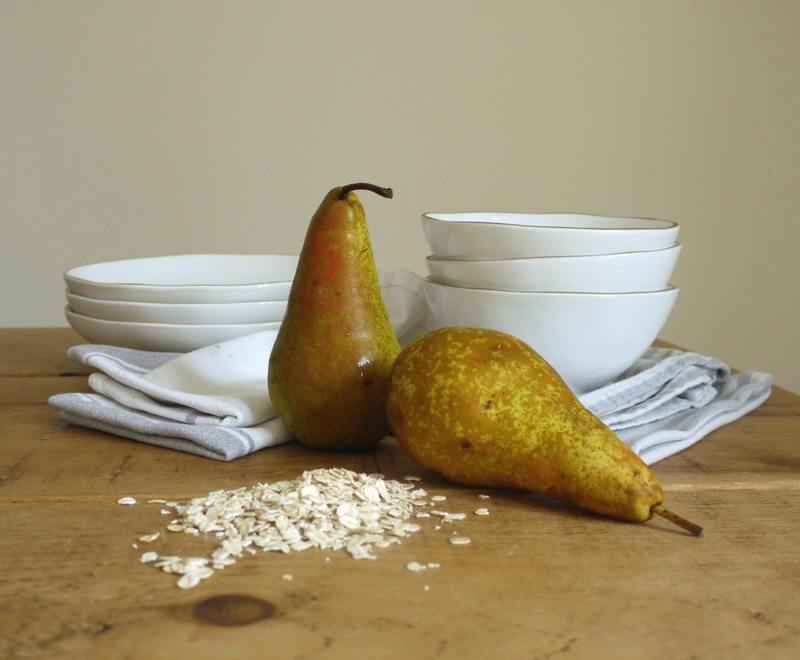 The Wobbler range is hand made in Portugal meaning no two bowls are exactly the same. There’s a lovely natural feel to them which fits in comfortably with my homemade tendencies, but from a practical point of view you can still stack or stick them in the dishwasher. They’re a little on the small side for soup, but perfect for porridge and other breakfast bowls (or a greedy serve of ice cream at any time of day). With Christmas just around the corner, Loaf are offering one lucky reader the chance to win a set of these ceramic cereal bowls in white (as pictured here) or jade. The winner will also receive a signed copy of my cookbook, Homemade Memories, which is filled with all sorts of delicious things you can serve in a bowl – Blueberry, Almond and Plum Crumble, Coconut Brown Rice Pudding, Fig & Hazelnut Bread & Butter Pudding plus a whole chapter on ice cream . . .
To be in with a chance of winning, simply tell me your favourite porridge topping in the comments below. For a bonus entry, post a photo of your favourite breakfast bowl on Facebook, Twitter or Instagram tagging it with #LoafBrekkie. The competition closes on Sunday 22ndNovember and I’ll announce the winner on Monday 23rd. 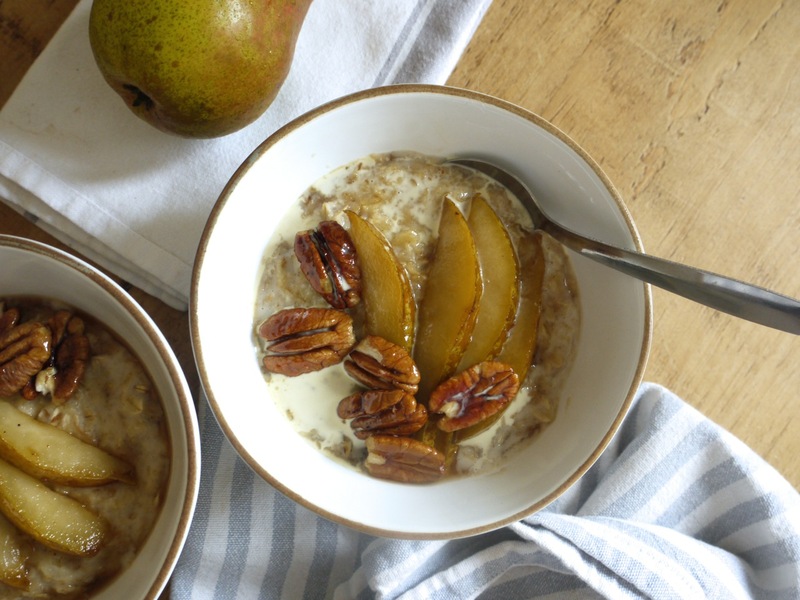 A warming, sweet and creamy breakfast bowl perfect for cold autumn mornings. 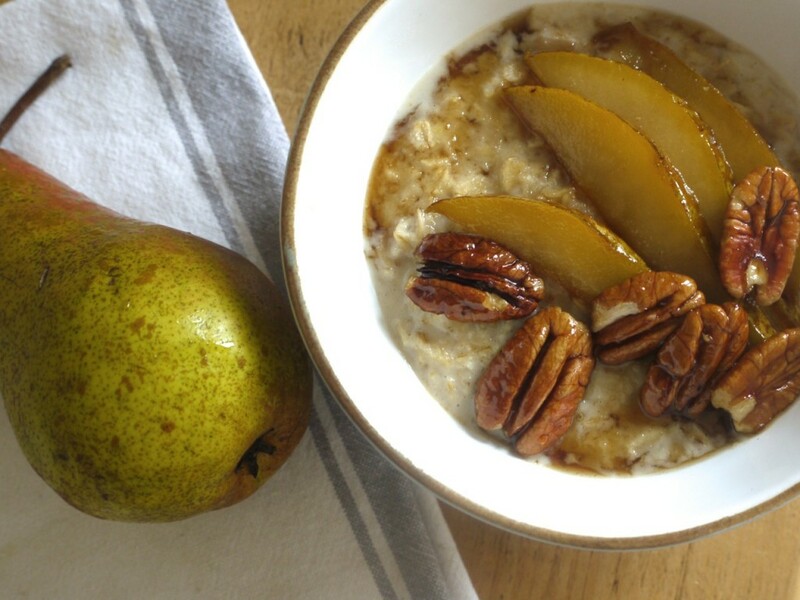 Porridge is swirled through with grated pears and spice before being topped with pear slices sauteed in maple syrup. Crunchy pecans finish it off and I like to add a drizzle of double cream for extra indulgence. Cut the pear in half. Coarsely grate one half and cut the other half into slices, lengthways. In a medium saucepan, melt the butter until golden and toasty smelling. Add the oats and toss to coat for one minute. Pour in the milk and simmer, stirring regularly, until the mixture begins to thicken. Stir in the spices and grated pear then continue cooking until rich and creamy. Divide between two bowls. 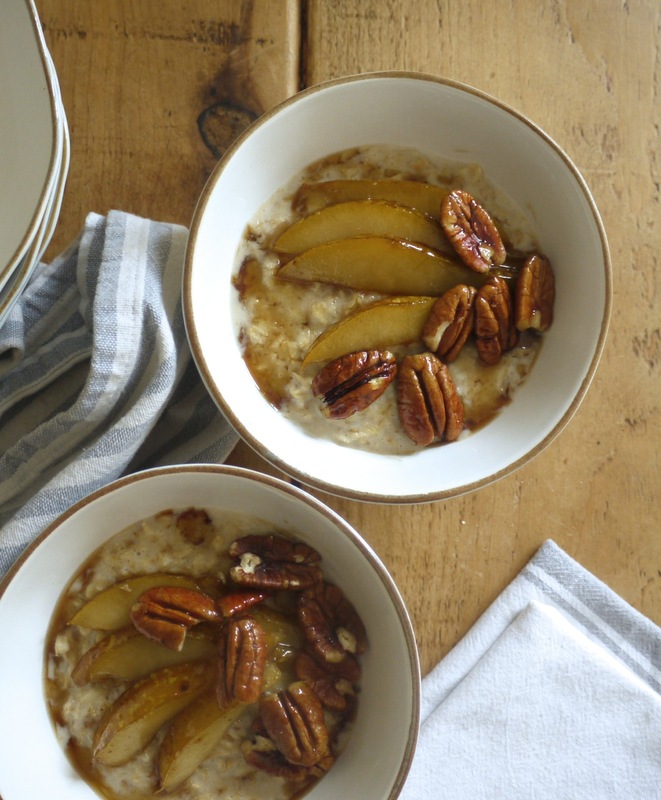 In a small saucepan, gently heat the maple syrup and pear slices for 2 - 3 minutes, until the pears have softened slightly and the syrup thickened around them. Add the pecan halves for the final minute of cooking. 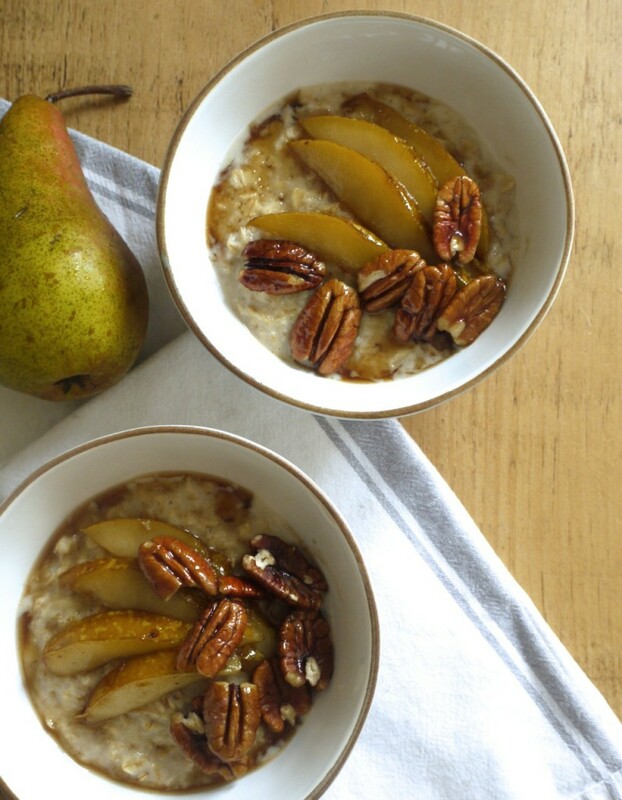 Divide the pear slices and pecans between your two bowls then drizzle over any sticky maple syrup left in the pan. Serve as is, or with a trickle of cold double cream. Toasted almonds and spicy cranberries are a favorite topping around here. Simple but delicious. A drizzle of black treacle. It’s got to be toasted pecans, maple syrup, with a smidge of cinnamon. Naughty but nice! For me, it’s banana and sultanas and a dash of cream on a treat day! My own bee’s honey and chia seeds. My fav topping is blueberries, strawberries and flax seed oil! I love mixing in cinnamon and nutmeg and topping it with banana and maple syrup. I saw this on your instagram and was so inspired by it I riffed on it this weekend without the recipe! I did a buttery apple cinnamon topping and a drizzle of cream, and it was just fab. But to be honest my all time favourite porridge topping is salted butter and brown sugar, which is how I’ve been eating it since I was a kid. Yum! My current obsession when it comes to porridge toppings: a veritable mountain of blueberries with a blob of almond butter. However, if there are decent ripe figs in the shops, I am all over those bad boys! This looks and sounds gorgeous, I have a chai latte addiction and to have it in porridge form just sounds obscene…ly delicious. My favourite (weekend treat!) way to eat porridge is pinhead oats cooked with almond milk, water and malted milk powder, then served with molasses and toasted cacao nibs. 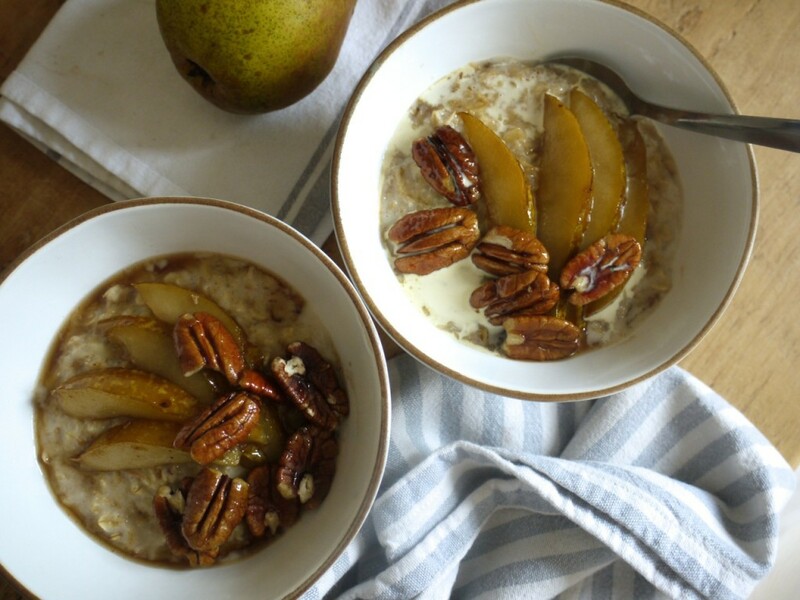 wow, that porridge looks amazing! I will definitely need to try that. I like porridge with grated apple, cinnamon and sesame seeds. I like a bit of crunchy with my porridge. I love blueberries and a sprinkle of cinnamon drizzled with honey……divine!!! For us here down South it’s all about using the best dairy milk one can get, a little dark heather honey, and perhaps some blackberries in summer or a bit of a roasted apple in winter. Yummy!! BTW, great blog!!! maple syrup and nectarine slices is my favourite! comforting. To be extra healthy add a spoonful of delicious blueberries!! Diced mango and brown sugar with a teeny bit of lime juice. Fresh fruit and toasted nuts by the handful..
yum it looks AMAZING! my favorite is cinnamon apple oatmeal! Smooth peanut butter and banana was a revelation to me, I didn’t think it would be good but it was and the protein in the PB keeps the hunger pangs at bay for just that bit longer. 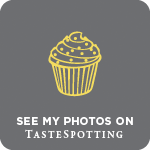 I love the classics – maple syrup, brown sugar and thinly sliced bananas. It’s something my kids and I enjoy on a regular basis but this recipe looks so amazing I may venture into something different. current topping: wild apples and sloe berries compote. I do a big pan of compote and keep it for a week in the fridge ready to use or I pour it in silicone muffin pan and freeze as individual portions. Whilst browsing around my local market a few weeks ago I came across a stall selling a wide verity of home-made jams, including the most delicious Raspberry Curd. It’s absolutely scrummy swirled into porridge made with almond milk and topped off with fresh raspberries and almonds….lovely stuff. Fig, honey and chopped pistachios! So yummy! Chopped up apples with maple syrup and a sprinkling of cinnamon, yum yum! I always reduce some frozen wildberries and put them over top with some cinnamon and local maple syrup. It is seriously delicious!